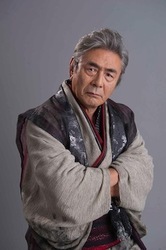 Hidekatsu Shibata is one of the most acclaimed voice actor from Japan. He has been active in the anime industry as a voice actor, as well as a co-founder of one of the biggest voice actor/actress management company Aoni Production. Most well-known for his performance as King Bradley from Fullmetal Alchemist, Hiruzen Sarutobi from Naruto, Monkey D Dragon from One Piece, Yi Xing Long from Dragon Ball GT, and Igneel from Fairy Tail. His half a century long career includes from old time classic anime, such as Tiger Mask, Lupin the Third, Devil Man, to the current anime series Pokemon, Angel Beats!, Senki Zessho Symphogear G, and even more. While being influential in the industry, he enjoys being an owner of a member's only private bar in Tokyo which has become a go-to-spot for anime creators and actors.